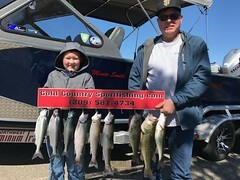 Returning client Mike Davis brought along his son in law and grandson for a days fishing on Don Pedro. I set out four rods and after 40 minutes we had our first fish of the day on and six year old Zachary reeled the fish in. 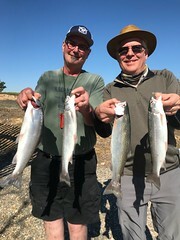 Fishing proved once again to be a challenge on this day but we stuck with it and they boated six rainbows and a bass for the day. Its a great time of year to fish the reservoir as the hills are green and the lake is full. Thanks again guys. 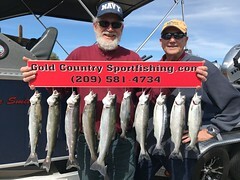 This entry was posted in Bass, California, Don Pedro fishing guides, Gold Country, Rainbows, Winter Fishing. Bookmark the permalink.